SEO campaigns are constantly evolving with changes to search engine algorithms and search tactics. Keyword priorities also change over time as your site moves up and down in search rankings. This makes SEO campaigns tricky to manage. Traditional project management techniques don’t cut it so managers need to think outside the box. Scrum is an Agile framework designed for managing software development projects. However, we feel that SEO managers can learn a lot from it! Sprints are at the core of Scrum. The workload of a project is broken up into segments and completed in sprints that can be anything from a day to a month. A Sprint Planning Meeting is held before each sprint to establish the goals to be completed and then a Sprint Review is held afterwards to evaluate the sprint. Sprints are useful for SEO managers as they can use each sprint to focus on a particular area or keyword before moving on to the next. This helps establish clear goals for every team member and keeps everyone on task. Just what they sound like – stand up meetings are meetings in which all participants stand up! This may sound tortuous but that is the point. Scrum meetings are daily meetings and so need to be kept short – 10-15 minutes maximum. If the participants of the meeting are standing up then they will be uncomfortable and push to end the meeting sooner and avoid idle chit-chat, going off topic or one-to-one discussion. Some people even recommend standing on one leg when speaking or holding a medicine ball! Scrum meetings are not designed to replace regular sit down meetings. They are a chance for team members to touch base once a day and ensure that everybody is aware of their responsibilities. One of the main advantages of daily stand up meetings is the reduced chance of overlapping work. If the whole team knows what each person is doing then it is less likely that two people will do the same task – this greatly increases productivity. In layman’s terms these are long and short term to-do lists. Items in the Product Backlog are to be completed during the project and are brought into the Sprint Backlog as appropriate. The Sprint Backlog is a list of items to be completed during the current sprint. These are helpful as every task is kept track of and prioritised. The more important tasks are completed immediately and the less important tasks are not forgotten. They remain on the product backlog until required. 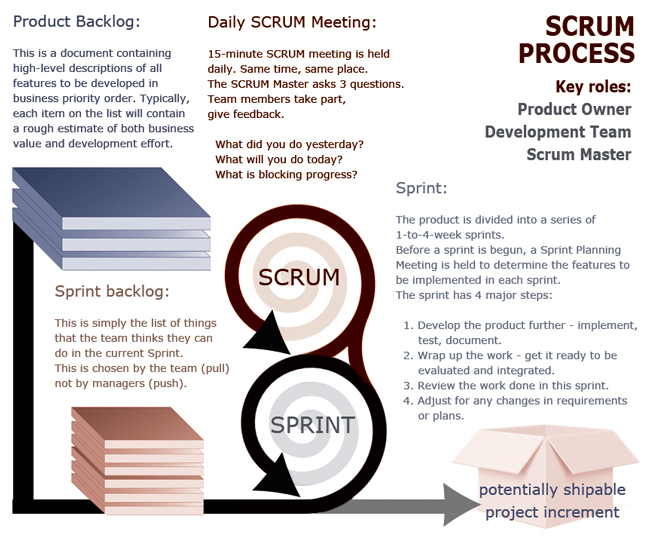 This Scrum Process Infographic was produced by Silicon Beach Training. The three elements of Scrum in this post are all covered as part of our certified Scrum Training courses. If you are new to SEO we also provide SEO Training at our training centre in Brighton on the sunny south coast.